The mahogany French doors open up to a grand living space with 14-foot ceilings, comfortable seating and light streaming in from the private pool area. Near the living room is the fully furnished gourmet kitchen with its two refrigerators, two stoves, two dishwashers, and custom wood cabinets. This roomy and well-designed kitchen with an island for food preparation will meet all of your cooking needs. Beside the kitchen is the over-sized dining table that seats 10 along with the breakfast bar that seats 6. The rest of the group can dine pool side under cover at the outdoor dining table. Seating will never be an issue here! Aegean has a beautiful 17x30 ft. swimming pool with LED lighting, water features and an overflow spa! This large private pool features a shallow island perfect for small children. Located on the pool deck is an outdoor summer kitchen with natural gas grill, 2 mini-fridges, a stand-alone icemaker, sink and cabinet space. Between the pool and summer kitchen is a large mounted flat screen TV which is perfect for watching the big game or your favorite TV shows. There is plenty of outdoor seating for relaxing poolside in the Florida sun. The neighborhood of Frangista Beach consists of mostly large homes where families come to vacation. It spans the equivalent of approximately 4 blocks. The neighborhood has a 400 yard private beach which you must have a code to access. This home is within walking distance of a coffee shop, deli, Dairy Queen, a beach gear shop and local favorite beach front seafood restaurants, Pompano Joe's and Whales Tale. Frangista Beach is also home to Emerald Coast Wine Cellars where you can sample and purchase wines made exclusively in Florida. A large Winn-Dixie grocery store is 1.5 miles to the east and beside it you will find the largest designer outlet mall in the Southeast, Silver Sands Premium Outlet. On the third floor is a hallway connecting the five suites together. The first two king suites feature a set of twin bunks and their own private baths. Each king suite on this floor is decorated in warm colors and have plenty of windows allowing for the comfort of the Florida sunshine to enter the room. Back into the main hallway is the entrance to the third floor balcony. This large balcony with its amazing aerial view is the perfect spot to enjoy the sunset in paradise. On the second floor there are three spacious king suites; two of them have with their own custom decorations and private bathroom. One king suite has a set of custom built twin bunks. Between the two king suites and the bunk room is a custom built bunk nook. The large 6 bed bunk room is custom built with plenty of light streaming in from outside and the room has its own private bath. The beautiful game room is decorated with a nautical style with a balcony overlooking the pool. * This home requires Sunday to Sunday rentals during our Summer Season. *Weddings/Events – If held on property or private beach an additional $500.00 HOA fee is required for permit. Please note tents and canopies are not allowed on private beach due to HOA regulations. *Frangista Beach Homes: ONLY Homes located within the Frangista Beach HOA are not subject to the separate Walton County Permit. Only Beach Reunion's $500 event fee. **All other homes within Walton County must obtain the separate permit through Walton County in addition to the Beach Reunion event fee. 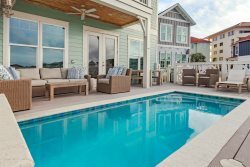 Margarita Machines - Margarita Machines - This home is proud to feature a "Destin Firefighters Margarita Machine" located in the home which is available for rentals (for an additional fee). For additional information visit our Margarita Machine page. Our concierge can arrange golf, dining, water sports, fishing trips and other services prior to your visit or during your stay. *Includes 4 chairs and 2 umbrellas set up daily. Free concierge services- our concierge can help you plan the vacation of a lifetime! All linens and bath towels are provided. Please provide your own beach/pool towels. Starter set of supplies. We will get you started and you take it from there! *Includes toilet paper, paper towels, trash bags, dish soap, and dishwashing liquid. Fully stocked kitchen! It’s like cooking at your own home! This beach house will have everything you need and more. Grill out by the pool. This home has a beautiful gas grill. Private pool. The private pool can be heated from October 1st - May 1st. *Please note there is an additional fee to heat the pool.